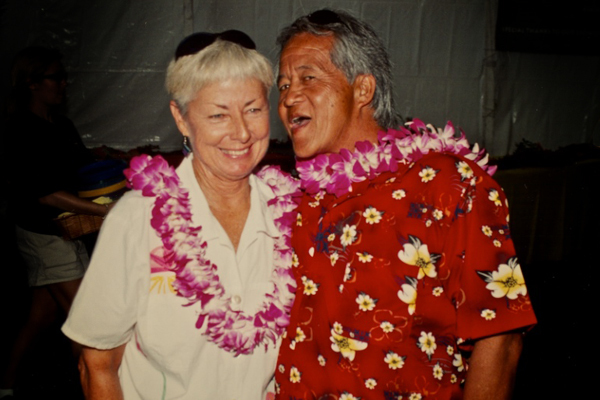 Linda Benson is a California surfer who was the first woman to ride Waimea Bay. She competed for 10 years in the ‘60s, winning titles in both the West Coast Championships and the US Championships. Still making surfing a part of her life, Linda was gracious enough to share her story. I was born and raised in Encinitas. Back then, everybody went to the beach in the summer. Moonlight Beach was simply the place to be. It had a recreation center, food and picnic area. Even the car guys would come down and wax their cars in a shady spot across the street. I first started riding those surf mats—we were fierce and had the greatest time. We were really good at it, riding big waves on our knees with hands in the air. For us, it was really a time of no fear. Do you remember the first time you stood up on a board? When I was 11, after my older brother got a surfboard, I remember watching the guys surf from the cliff. I thought it was the greatest thing I ever saw and something just happened inside (of me). I just knew I had to do it. It was right before the surfing boom and it all was just starting. My soul was just absolutely drawn to it. I would sit on the beach and wait until someone lost their board and then hang on to it in waist deep water until they got to me. I remember just touching the boards—it was just an immediate connection. Finally, one guy said “Do you wanna try?” Boards were big back then and I remember just popping up right away; it wasn’t very hard for me since I was so small. I can still visualize it in mind as I was riding that wave. And that was it. Back then a lot of people didn’t know about surfing. This was before the Gidget book or the beach party movies or even Surfer magazine. We knew we had something special. We had a vibe, a feeling of such “inner stoke”. We just knew. I’m from down here, but I’ve spent most of my life in Manhattan Beach when I worked for United Airlines for over 35 years. When I started to fly for United, I was fortunate to be able to fly only to Hawaii for many years. It was a dream job for me. I rode for Jacobs when Donald Takayama shaped for him and I took that board to Hawaii. It was just a simpler time then. On my first trip, I just walked up to the guys with my board and they just placed it in the belly of the plane. Of course, you couldn’t do that today. Well, we all looked up to Phil Edwards. One day he paddled by me. And it was the way that he was kneeling on his board with his white trunks and great body. He was positioned so perfectly on that board. It was a beautiful sight just to watch him paddle. Of all the places you’ve traveled to, what place stands out for you and why? There are so many wonderful places with waves. I was able to experience some beautiful areas of Australia, driving from Sydney to Surfer Paradise after the World Contest in 1964. I like to go to Mexico in the wintertime. But I really love Hawaii. It is one of the greatest spots in the world. I even like Waikiki. I’ve been flying over there for a long time and I sort of got into this grumpy thing with all the crowds in town and in the water. I just really had a hard time with it. I finally had to tell myself, “It’s just not going to change.” Since then, I have been able to look past all of the people and I began to enjoy the beautiful water and sky all over again. What period of surfing holds the most cherished memories for you? I was pretty happy when I won the Huntington Beach U.S. Championships during the 60’s. It was a fun time seeing friends and cheering them on. There wasn’t any money in it, but it was the contest. Of course, some of the time it was closed out and breaking through the pier, which created great drama. The Huntington Beach Walk of Fame was also a pretty special award. Throughout the years, there have been many occasions when I have taken home awards that will always be special to me. Tell us about the Women’s World Longboard Championships. I took over the Championships in 2005. I never thought I would take on such a thing. I always tell Hank Raymond, who started the event in Costa Rica in 1999, “It’s all your fault!” It has been so special to me to watch longboarding grow and to see the women get the recognition they deserve. It’s really been very special for me to give back in a way I never expected. I want everyone to know about the proposed 2010 Women’s World Longboard Championship at Swami’s. There has been opposition from some of the locals. We think a beautiful, well-planned surfing event for women would have a positive impact on the lifestyle, sport, industry and the local community. The idea of spreading the positive message of soul surfing balanced by promoting the sport to the community would be an added benefit to many in this difficult economy. The set-up will be small and garden-like, respecting the sanctuary feeling and vibe of Swami’s andSRF. Every aspect of the care and protection of Swami’s is being considered. Swami’s is a world class wave and its location provides a close walking access to the planned Encinitas Surf Festival at “K” Street, the city and merchants creating a village atmosphere. It will be an event that would bring people to the contest at Swami’s, but allow them to leave easily and enjoy the festival and fun activities that would be happening elsewhere around town. A number of non-profits spanning the health, environmental and historical fields will be featured and supported. Donald Takayama shapes all of my boards. I’ve known Donald since I was 15. He is one of my dearest friends. There were times when I stepped away from surfing for short periods of time and he’s always been there to say, “Come back. And here’s your board.” We’ve both supported and helped each other through the years and he has been a great, great friend. How is surfing special for you? For me, it’s self-expression—it’s how I express myself. Someone once said, years ago, that it’s like we use the wave as our canvas and the board as our pen. This is our art. I’ve always believed and felt that. Surfing is a true inner art form of expression. Each wave is different and each one a different painting. I have been really lucky. I’ve gotten a lot of gifts through the years because of surfing, for which I’m very grateful of. What was it like to be the first woman to ride Waimea? Back then (1959), everything was new. The gender thing didn’t play a big part in it. I was 15 and we lived in a little cottage on the North Shore with people like Bud Browne. We were all just teenagers. I remember that day. They were calling it 18 feet. We stood on the cliff just watching the waves and kicking the dirt, trying to decide whether to go out or not. There was a small guy from Windansea named David Cheney. He had the smallest board, a 10 foot gun, and he let me borrow it. I waited for a lull and my heart was pounding. I didn’t think about whether or not I was going to be the first girl. I just went and did it. As I paddled out, I saw Fred Van Dyke wipeout. He popped up and then two parts of his board popped up beside him. Another set came in and John Severson rode a wave and then he wiped out. He looked at me as I was paddling out and said “You’re crazy.” When I came back in, I remember just stumbling over myself. I was just so happy I had done it and that I was back on land. It was amazing. I never did it again and I never wanted to! What brings you the most happiness in life? Peace. Fun. Friends. And good warm surf. My surfing. It’s allowed me to have a journey that has been unbelievable. Words could never describe my gratitude for all the gifts it’s brought my way. My life without surfing would have been so totally different. It might have been pretty boring. And I am proud of my Surfher Surf School that I started and ran for 5 years. To see the look on the faces of these women and girls surfing for the first time was both touching and amazing. Well, I eat pretty healthy. I don’t eat pasta a lot but I think it’s wonderful. (Laughs) And I like Mexican food, too. There is also a new cookbook, that I have a recipe in, called Surf Food by Nava Young (daughter of Nat Young), and the book is absolutely wonderful. I like Jack Johnson or anything contemporary. I like all of the popular songs of each decade. I love The Beatles and The Stones, Bob Dylan and music of that era. I think the ‘60s was the greatest music era of all time. What’s next for Linda Benson? I just want to surf and enjoy each and every day. Help Linda bring the WWLC to Swamis here. 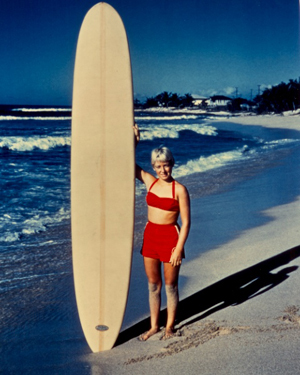 More information about Linda Benson can be found at theSurfing Museum. Photography credits: John Severson, John Elwell, Tom Keck, Anonymous, and Chris Grant. Images are for this interview only and may not be used without permission.